Of course you have. It’s shouted at you from experienced bloggers and influencers everywhere…but here’s the thing…. Email marketing is the most powerful marketing channel for bloggers, and should be treated with massive care! What is an email list is and why is it important? Thorough reviews on the best email service providers (ESPs) for bloggers. Bookmark this page and refer back to it as needed! Before we go any further, I want to express the importance of creating opt-in forms that STAND OUT with your audience. 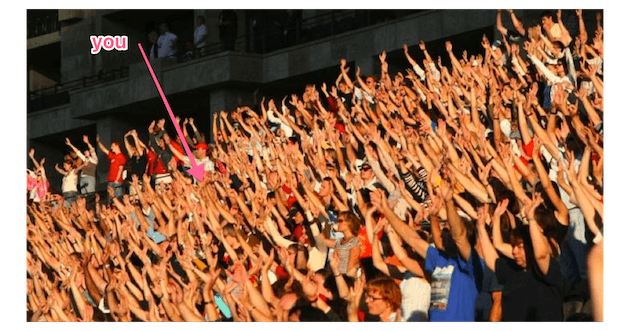 My audience is bloggers (duh)–so whenever I make opt-ins, I try to take them a bit by surprise. This is my email list guarantee. We do love to talk about blogging, digital marketing, side hustles, and making a living in online business. Our newsletter will not disappoint. Join us today to start receiving exclusive content we don’t publish on the blog. An “email list” is a collection of your readers/fans’ email addresses, which you plug into software (ESPs), sending communications to your audience! other meaningless channels that are likely a waste of time. 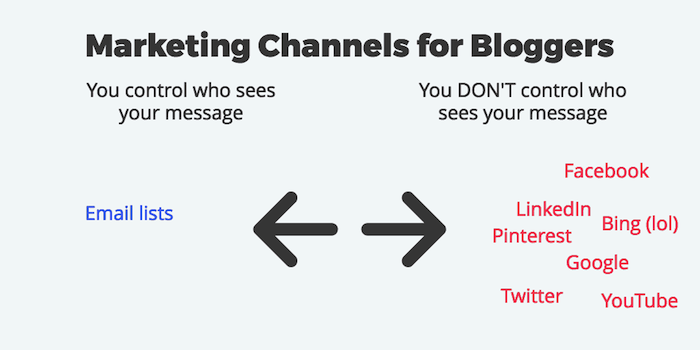 What do all those marketing channels have in common? You don’t have control over whether or not your content is actually put in front of your audience. FB, Twitter, Google, Pinterest, etc….these use fancy-pants algorithms that choose what to show to whom at what times. You’re in control, and there is a 100% chance your subscribers will see you’ve communicated something to them (unless they never ever check their email again I suppose?). If they check their email 17 days after you sent your newsletter, it’ll still be there. (They could insta-delete it of course, but let’s discuss that later). What sort of things do I email my email list? 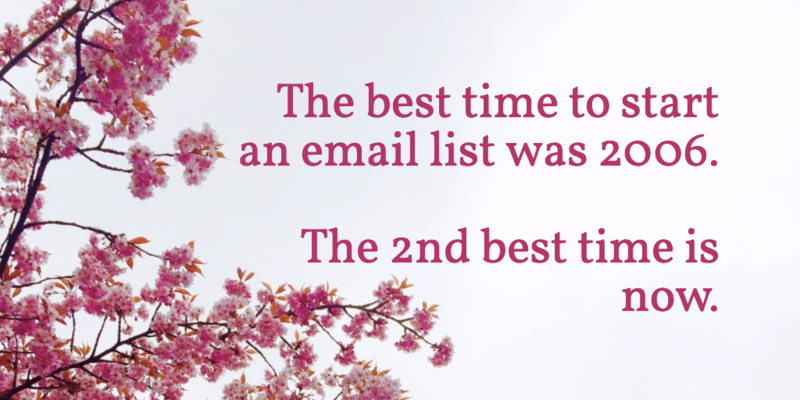 Email your list 2-3 times a month with personal, engaging emails, and let them know what you’re up to! As already mentioned, even the “pro” bloggers are often heard saying they wished they’d started an email list sooner. Tim Ferriss, Pat Flynn, Amy Porterfield. They’ve all said this. If you don’t already have a list, start one today. If you have a list but don’t focus on it, start focusing on growing it! It’s important! In fact, Sarah Peterson from Unsettle.org started her email list *before* she launched her blog. She put up a simple landing page with a paragraph or two explaining what her blog was *going* to be about, and offered a content upgrade before she even launched. She grew an email list before she started blogging, and come launch day? She have over 4k pageviews the first day. Learn from her, and start growing an email list ASAP. The future blog traffic and revenues will thank you! We’re all biased towards affiliate commissions. Sign up for ConvertKit using my affiliate link, and I get a cut of the profits. So, while we recommend ConvertKit (it is awesome) over and over again, just be aware that we’re searching for affiliate income. Under no circumstances should you, a newbie blogger, start off with ConvertKit (sorry CK. love u). Start with a free and powerful platform like Mailchimp. Once you learn what the heck you’re doing (let’s face it. If you’ve been blogging for less than 6 months, you don’t know what you’re doing yet), THEN switch to CK, or Aweber, or InfusionSoft. See the email service provider guide below for more reviews and info. Opt-in forms with no personality and absolutely no incentive to join. (Also, who wants to receive more ‘notifications’ of any kind? That word holds a negative connotation for most folks). Question: Pete, what is a content upgrade? Answer: A premium piece of content you give away for free in exchange for peoples’ email addresses. Answer: I list a ton of them just below this section. Question: Why does this work so well? Answer: It’s essentially “selling” your readers something they want (hopefully), for emails, rather than money. They can always opt-out later, making it very low risk. Question: How do I technically deliver these content upgrades? Answer: It’s complicated. See below. Sadly, the technical delivery of content upgrades will depend on your chosen ESP, as well as any additional list-building software you use (Sumo.com? Thriveleads? Leadpages? etc). In general, the simplest way for beginners to set up a content upgrade is through their auto-responder. Log-in to your ESP and upload your pdf, video, etc…to your auto-responder. (If you don’t know what an auto-responder is, click here to learn more). Content upgrades aka “freebies,” are the single best way to grow an email list in a semi-passive manner. Choose the content upgrade you want, create it, and deliver it using your ESP or list-building software. Make sure it’s something your audience WANTS, or values. If you’re creating a freebie for a specific post or page, it might help to make it relevant to the post content. bonus video – Repurpose your current blog post (or pro tip: your best performing blog post to date) into a 5-10 minute video. DON’T overthink production. Just start talking to your webcam or iPhone. Seriously. Try to deliver content, and stop focusing on production quality. Just use YouTube or a free Vimeo account. bonus audio (podcasts rock!) – Same as above. Repurpose your existing content to audio, for people on-the-go. (I intake 80% of my content these days via audio.) Just start by uploading to free Dropbox or Google drive, then linking to audio files for delivery….or start a podcast on the cheap and easy with Podbean (it’s who I use). If you want to learn more, take my free podcasting course here. infographics – Use Snappa (free and paid) or Canva (free but annoying) and use one of their pre-made infographic templates. It’s easy, kind of fun, and could be a fun addition to your content. checklists – If you’re teaching something, providing instructional content, and handy checklist (limit it to 1 page please) could be an amazing and easy freebie. Example: For this “how to build your email list” blog post, I could make a “7 things every blog post NEEDS for list growth” checklist. “cheat sheet” – Kinda like the checklist above, this should be a short and simple summary of a given topic. No reading for 20 minutes…just the important bullet points and 1-2 sentences of explanation. ebook or long-form content – this content shouldn’t be available anywhere else. I personally don’t find these as valuable. Free course – I recommend email courses, as people generally know what they’re signing up for. Both Mailchimp and ConvertKit have systems to deliver these! See that free podcasting course I mentioned a second ago? Prime example. Any other valuable something 🙂 – Let your imagination run wild. The trick is to create something desirable for your audience! Many bloggers have a fear of asking for anything, including their audiences email address. Get over that fear ASAP. Furthermore, what’s the point of list building again? Effective communication with raving fans that know and trust you. And who are some other people that know and trust you, and are prime candidates for becoming loyal fans, no matter what?? The top 5 people in your address book (i.e. smartphone). Who would say ‘no’ to that? In Bryan Harris’s 10K Subscribers course, this is his lesson #1. 0-100 subscribers. Call, text, or Facebook message (no email preferably) and use the same template as above. These people do not have to be in your niche. They DO have to know, trust, and like you. They will be your early blog ambassadors, will likely share your content (simply because they know you)….and they’ll be the cornerstone of a healthy and growing email list. That’s what average bloggers do. Don’t be average. 6 – Produce kickass content worth reading, sharing, and sharing again. Seriously though. Content is king, still. Especially going into 2018 with more blogs coming online in every niche. I won’t spend forever on this, but you must, must, MUST focus on creating content that is worth reading. Only you and your audience can really define what that looks like explicitly, but it’s a mandatory for successful blogging. Make content longer, but more skimmable. When you think it’s done and ready for publish? Make it 20% longer and better, then edit 40% of it out. In that order. Don’t settle for mediocre content just because it’s there on the WordPress dashboard, and the publish button is so close, and you neeed content to go out today. This is more advanced strategy, and requires a bit of guts…but doesn’t have to be complicated! Pick something your audience, really, REALLY wants. It should be niche-specific (no iPad giveaways). It should be something worth opting in for. Would you opt-in to your own free e-course? NO. Give away $1,700 of travel gear, and you can be DAMN sure I’m going to sign up and share. Use a giveaway tool that encourages sharing (Kingsumo, raffle-copter, etc. Try out Amazon giveaways as well. Google it). This step is vital. Promote the heck out of the giveaway. The cheap part of you is going to want to skimp on the object of the giveaway. This is almost always a sign a giveaway won’t perform as well as you’d like. You’re better off getting 700 new email subscribers giving away something that costs $1,000, than getting 25 email subscribers for something that cost $100. Make it worth it. Here’s further reading for advanced email list builders! Not landing pages. People talk about “funnels” for a reason, and pointing paid reach directly to product pages or landing pages skips several steps in the funnel. Skips important steps in the funnel. You’re going to do better over the long run if you utilize paid reach to drive traffic to your *all-time best* pieces of content. This is advice from Bobby at MillennialMoneyMan.com (I’ve had him on the podcast twice. Here and here. ), who gets incredible CTRs and low CPC’s with Facebook ads. (Like, $0.05 a click sometimes? Insane). Think long-term. You’re trying to convert traffic into long-term raving fans, not short-term paying customers. Don’t send crappy emails. Ever. Keep your emails short and to the point. Don’t waste people’s time. Try to add value *within* the body of the email…though this is a bit more advanced. Avoid “walls of text.” (see below). Occasionally, provide exclusive content to your subscribers. Some deal or piece of content that can’t be found anywhere else! This will encourage them to open future emails. 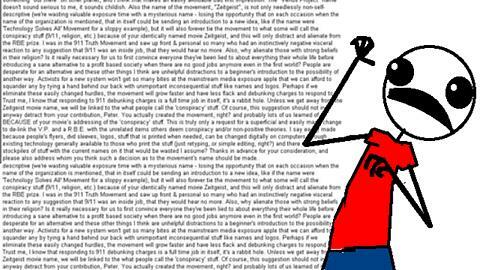 wall of text? Will. not. read. ever. 10 – Don’t ever be spammy. Ever. Unfortunately, how often you email your list varies from blog to blog, niche to niche. My niche is other bloggers. I CAN’T email them 3 times a week, like, ever. They don’t want that. Scott’s cheap flights, on the other hand, I am thrilled with every email they send, and would open one every single day. It’s a different type of email w/ a different purpose. Any email course you setup could potentially be sending automatically. So if someone signs up for a daily course w/ 5 lessons, and you send them 2 normal emails that same week….they have 7 emails from you in 7 days. That’s a lot. Be mindful. Sales weeks (i.e. weeks where you’re launching some product/service) often require more emails. This is tricky, especially for beginners. The key here is proper list segmentation and timing, which takes some technical skills w/ your ESP. In general, send helpful emails worth opening, and you should be fine. 11 – Don’t overcomplicate things. Keep it simple. This is directly related to point #1 above (start collecting emails yesterday). The process of launching and growing an email list can be overwhelming. do tricks/tactics/hacks/freebies x,y,z, and a, b, and c.
and oh, yeah. keep blogging. You will do well to keep priorities straight. A+ content first and fostering your loyal tribe = FIRST. All fancy list-building stuff = SECOND. Keep things simple to start. Use Mailchimp, email 3-4 times a month, and send short useful emails concerning your latest posts and news. Add advanced techniques as you grow. Chris at KeepThrifty.com found that when he placed his call-to-action email opt-in AFTER his content, it converted better than when at the top. He believes it’s because his audience has read his content, has seen what he’s about, and trusts him more than before they read the content. Trust = more email opt-ins, more sales, more followers. I’ve personally found my sidebar opt-ins perform best of all. I usually promote one. content upgrade at a time, but always in the same place. Sadly, the only actionable advice to takeaway is this: everyone’s different, and you must experiment and test! 13 – Use free software to start. PLEASE. Eden uses Thriveleads, OptinMonster is good, and I use Sumo.com. Sumo is the only one of those with a robust suite of tools for growing an email list….for free. There is a paid plan, but you absolutely do not need it. Especially when you first start! Every email service provider I’m aware of offers this, and it’s mandatory. Based on which subject line had the best open rate after a few hours, your ESP automatically sends the “winning” subject line to the rest of your list. Below is a recent email I sent in ConvertKit. I A/B tested 2 subject lines. B had 54% open rate after 4 hours. ConvertKit sent B to the rest of my list, leading to an overall open rate of 44%. A/B testing takes very little time, and can potentially do wonders for your open rates! you want as many opens as possible! 15 – Offer something exclusive just to email subscribers. On occasion, you need to provide something of value to your email subscribers that can’t be found anywhere else. Do this in addition to letting your fans know about your latest post, etc…and you will greatly increase the value of your emails. For example….when I email my list about THIS very post…I’m going to include the content upgrade link for them…no opt-in required….as well as a bonus video. This won’t be found anywhere else. A treat for my subs! 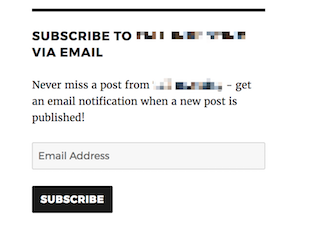 I place my unsubscribe button up TOP in all my email newsletters. Why? Because I want more unsubscribers, duh. I’ve received numerous compliments on this one silly idea.It makes people take notice. Sure, people click it…but those people weren’t going to be long-term Do You Even Tribe members anyways! To make impact, you’ve gotta be heard. And to be heard, you need attention. Grab it. 17 – Optimize your ‘home’ and ‘about’ pages. Quick, head to my home page. What do you see? My blog roll? A list of podcast episodes? 17 paragraphs about how amazing I am? My homepage is THE most visited page on my entire website, making it ideal for collecting emails. Another fantastic place to put an honest and transparent opt-in is on your /about page. (Mine is fairly well hidden, hence you don’t see it in the report about). For one, it’s where your website traffic goes to learn about you, your blog, and your mission. This page should have reader TRUST at an all-time high! And remember what we said? Trust = more subs, more revenues, more rabid followers. Sorry. Raving. I meant raving followers. 18 – Look for free or cheap (less than $300) courses on list building. If you find a highly-recommended and reasonably-priced resource (like Eden Fried’s 30-day list building challenge), don’t be afraid to pull the trigger and learn as much as possible. There are several amazing free list-building courses out there as well. Leadpages has an amazing free course. Bryan Harris has a nice course (WARNING: this is a funnel for his uber expensive 10K subs course, which I do not recommend). There’s still great stuff here though. 19 – Don’t pay for ultra-premium online courses until you’re ready! You’re not ready. The information, wisdom, and experience you seek is out there on the internet for free. You just need to find it. Though there are several tips in this guide aimed at getting you quick email list wins (namely running a giveaway, and manual outreach to people you already know), growing an email list takes time. Growing an email list takes time. 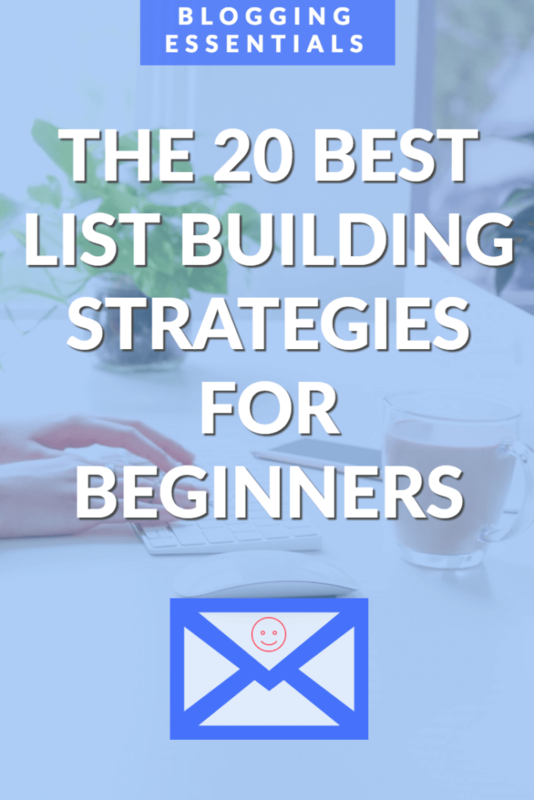 Additionally, this is a HUGE list of email list building strategies. Beginners will 100% get overwhelmed at first, and likely lose focus. Start small, start simple, and learn over time. New bloggers: Don’t get frustrated when content upgrades fall flat. List building takes time. The key to winning the blogging game is persistence and consistency. Keep pushing, and growth WILL come. Which email service should I use for 2018? Rather than providing broad “recommendations” that are really just for affiliate marketing income (heehee)…I’m going to straight up tell you what to use. Seems uncomfortable and unfair, doesn’t it? You have 0-1,000 email subs – Use Mailchimp. Reasoning –> You don’t need all those fancy tools you THINK you do. Stick with free Mailchimp to begin with. It’s easy, and it just works. 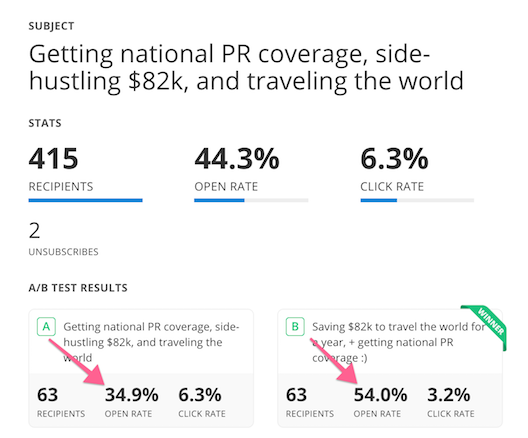 Once you get more experience (and revenues) under your proverbial belt, switch to ConvertKit for some power features (sequences are amazing, as are tag/segments). Once you REALLY get cranking, switch to InfusionSoft for better pricing and more technical software. View their pricing page here. I’m not just saying this because they’re from Atlanta, but MC is an incredible platform. It’s free up to 1,000 subscribers or 2,000 monthly emails sent. VERY affordable, while still being incredibly easy to use. It’s perfect for beginners, but they have super powerful features starting at about $10/month (still cheaper than ConvertKit’s smallest plan). I’ve used Mailchimp on and off for over 5 years, and sincerely and honestly recommend them. No affiliate necessary. I love, love, love the way CK segments and organizes subscribers. Tags/forms/segments are awesome. Sequences are extremely user-friendly and effective. In general, these 3 are what made me switch from Mailchimp to ConvertKit, and I’m not looking back. ConvertKit does NOT have a free plan. It’s frustrating, and thus I can’t recommend it to newer bloggers. They simply don’t need the extra 10% features for the price. (Starts at $29/month and goes up QUICK as your list grows…). Still, if you have experience and revenues, you should probably be using CK for anything less than 10k subs. Though Drip does offer a small free version (up to 100 subs), it’s $41/mo up till 2,500 subscribers. However, their platform is EXTREMELY user-friendly, with amazing features. I use Drip on a separate client project, and it has been wonderful to work with. And once you get to the 1,000 sub mark, it’s actually more cost-effective than ConvertKit, with great features. HIGHLY recommended! 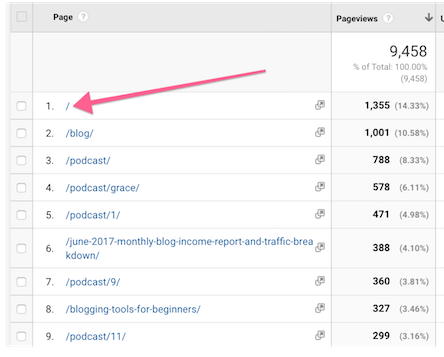 Aweber had a huge market share of bloggers just a few years back, before ConvertKit entered the scene. Now they’re playing 3rd or 4th fiddle, so to speak. Plans start at $19/month u to 500 subs (that’s fair), and ALL plans have ALL features. If you’re just not cold on Mailchimp or ConvertKit, give Aweber a try. It’s affordable, and has all the nice features you’d want, even in the low plans. The good thing about AC is it has more robust features for marketing and sales (CRM tools included). The bad thing about AC is bloggers don’t really need most of those. Mailerlite is cool, and though I’ve never used it personally, it totally gets my recommendation. I’ve seen Mailerlite recommended several times by bloggers I know and trust, and thus it gets my seal or approval. Also, people speak wonders about their WordPress plug-in. Definitely worth trying if you want a slightly smaller price point than CK! Though CC has been around for ages, it’s not aimed at bloggers…it’s aimed at small businesses. Simply put, don’t use CC. Their plans are terrible. They only have two (the price scales w/ subscribers), and the lower one has NO automation tools? But is still expensive? Forget about it. Plans START at $99/month, but that’s ok. Infusionsoft isn’t aimed at everyday bloggers, they’re focused on the big fish. IS features all the usual features, as well as advanced marketing and sales automations/tools. I’ve personally never used IS, but I do see it’s what a bunch of big name blogging “influencers” are using. Their features do look pretty sweet, but it’s definitely geared towards marketing professionals. I.e. You start making $99k/month, and hire a digital marketer to run your campaigns. At which point, ya know, show your old friend Pete some love. Plans start a $79/month. This is also geared towards marketers, which is fine if you are one. If you’re not super gung-ho and saavy about marketing processees, then forget it. Not worth the features you’ll rarely use. Use CK till you can afford a marketer, then IS. New blogger? Start w/ Mailchimp because it’s powerful and free. 500+ subscribers w/ a little bit of cashflow? Switch to ConvertKit for powerful features geared towards bloggers. Be sure to grab them by clicking the image below. Thoughts on these email list building strategies? Comments? Questions? Long post! Please let me know if you finished! Great post Pete. As a new blogger I found a lot of great content on this post. Thanks for taking the time to add so much value to a bloggers journey. I will come back to this post often. Fantastic resource, Pete! I pinned this for quick reference and also implemented a couple things noted here. Keep up the fine work. Super helpful Pete! You had me at free. I’ll forward this to a friend of mine who is comparing email marketers (and will look to pay $$ for the ease). I have no idea how you just got me to read this whole damn thing at 730 in the morning, but you did. Congrats. From a slightly experienced blogger making money, this article is 100% on point. I will say InfusionSoft is amazing. It’s like the Bob Vila of ESPs… has every tool for every job imaginable, I swear. Haha what on Earth. Go back to sleep! But on a serious note, I want to ask you about IS now. I’ve been curious ever since the Work at Home stuff a few months back. Interested in seeing their affiliate products. I swear I will figure out list building and stop being scared of new technology…. *deep breath* Thanks for the in-depth post! oooo it never ends lol. It’s like you have all I NEED TO KNOW! I love how REAL this is. Encouraging yet realistic, I am definitely learning a lot from DYEB! Ha! I’m sure that’s not entirely sure—but I do appreciate the kind words! At every contact I have with your writing, I’m grateful. Thanks so much for all that you do- I’ve learned so much from you within the short period of time that I’ve been following you. You really do demonstrate KNOWING YOUR AUDIENCE & ADDING VALUE. Very kind words, Margo 🙂 Thank you for that, I mean it! I had previously tried and set up 10 day welcome messages. Then it blocked my account. I believe I may have put some affiliate links in the emails which it didn’t like. I’ve also tried the free trial on gettesponse which worked great. I’ve heard a lot of good things about convert kit so I intend on getting those first 1000 email addresses and then making the switch! Love the idea to get 100 email addresses. This has moved to the top priority for me now!! ha! I appreciate that Mike lol.